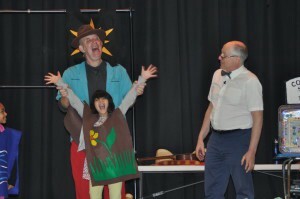 For the second year, Evesham’s Clean Communities Program has been able to bring “The Grand Falloons” educational performance to students in our elementary schools through Clean Communities grant funds. A total of 30 elementary classrooms of children from VanZant, Beeler and Evans schools were entertained and taught. The Grand Falloons have a way of teaching that is both fun and memorable. The performers are very popular. In addition to being 20 year veterans of the Big Apple Circus, the performers have an elementary teaching background. They have appeared on the Letterman Show and Late Night with Conan, and have performed for many school districts throughout New Jersey and New York and various locations across the country. The Grand Falloons tackled important topics including limited resources, the water cycle, landfill capacity, litter abatement and recycling. 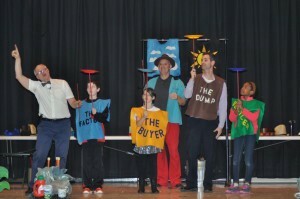 They integrated songs, circus and magic tricks, and slapstick humor with important lessons that correspond with Evesham schools earth science curriculum while keeping the children completely engaged. “They are able to illustrate concepts in way that the students can relate and understand, as well as have fun and be entertained,” Pease said. Pease had an opportunity to speak with some of the students after one of the shows.